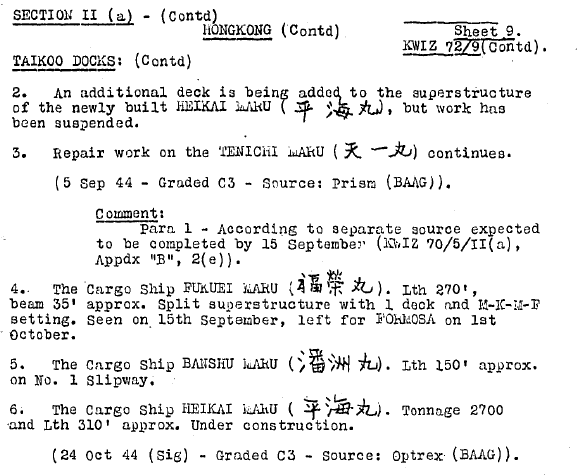 HF: Elizabeth Ride has sent information about four Shipyards from BAAG reports made during the Japanese occupation. This information is of interest with regard to what was (or wasn’t ) happening in them in 1944. The first Taikoo Docks is well known. The other three much less so. Kwong Hip Lung Shipyard, Wing On Shing Shipyard and Tai Kok Tsui Shipyard which I believe was connected to Cosmopolitan Dock. I will open a separate post for each of these to which we can add information as it comes in about their general history. The image accompanying this article show Taikoo Docks during a US bombing raid WW2. Fukuei Maru would need more research, as there were many ships by that name and around that period. Ditto Banshu Maru, another very common name. It looks more than a “little digging”. Detailed research, thanks Mike. I hadn’t come across some of your sources.In particular http://www.wrecksite.eu As a result I have posted a new article Hong Kong & Whampoa Dock Co. Ltd – ships built, wrecked during WW2 using information obtained there. And included wrecksite under Resources.